Nikolai Mikhailovich Przhevalsky is an outstanding Russian traveler devoted his life exploring Central Asia. In his memory, a memorial complex was built on the highest point of the eastern coast of Issyk-Kul, 12 kilometers from the town of Karakol. 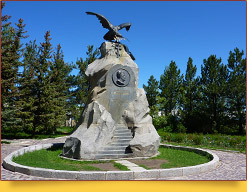 The memorial complex of N.M. Przhevalsky is located inside the reserve, named after the traveler. There you can see the museum, a monument and the grave of an outstanding pioneer. The museum is located in a small house where the traveler died in 1888. You can see his personal belongings, ancient coins, documents, maps, as well as models of various animals among the exhibits. The monument has a form of a nine-meter graniodite cliff, with a bronze eagle with open wings on top of it. A map with Przhevalsky's travel routes is hanging from the feet of an eagle. In the upper part of the monument, there is a cross, and carved bas-relief of scientist below. An inscription "Nikolay Mikhailovich Przhevalsky. 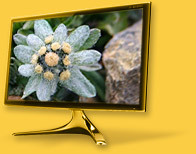 The first researcher of Central Asia nature. Born on March 31, 1839, died on October 20, 1888”. Steps lead from the center to the foot of the cliff. Przhevalsky bequeathed to be buried near Issyk-Kul. A little away from the monument is his grave covered with a carved stone slab. A flower garden surrounds the burial. The architect of the grave complex was Alexander Bilderling, and the sculptural works performed by academician Ivan Shreder. The memorial complex is situated in a picturesque place with magnificent view over Lake Issyk-Kul. Harmoniously combined with the surrounding nature, the complex keeps the memory of Przhevalsky’s great accomplishments.